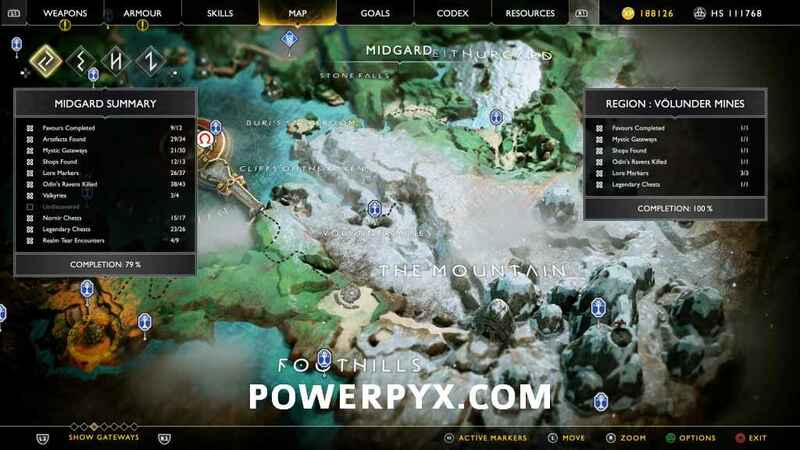 Volunder Mines contains 8 Collectible Locations in God of War (2018, PS4). This walkthrough will guide you to all the collectibles in Volunder Mines Region in chronological order. Everything that’s needed for trophies and 100% completion is included. Nothing is missable, everything can be collected after the story. To access the Volunder Mines you need Brok’s side quest “Second Hand Soul” which you get by talking to him at one of his shops. You get this side quest by talking to Brok at one of his shops and choosing the prompt. Unlocks as you progress through the game, can still be done after the story. You need this quest to access the Volunder mines. After you land at the Volunder mines by ship, take the elevator up the beach. The raven is flying above the elevator. On the path leading into the mines, in plain sight. Unmissable during “Second Hand Soul” Favour. On the path leading into the mines, in plain sight (right after Brok’s shop). In the area where you fight the “Soul Eater” boss in “Second Hand Soul” favour. Right after the Soul Eater boss fight, when you climb up the golden chain that Atreus drops down for you. That’s 100% of the collectibles you can find in Volunder Mines area in God of War. For more Collectible Guides, check out the complete God of War 2018 Collectibles Guide.